Mém. Mus. Hist. Nat. 17: 114 114 1828. Altitude: Grows at altitudes of 1200 to 2250 metres above sea level. Habitat: This species is rare across its range and occurs in submontane matorral in calcareous soils. 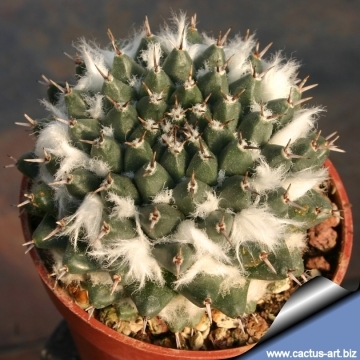 Mammillaria caput-medusae var. centrispina Salm-Dyck in Labour. 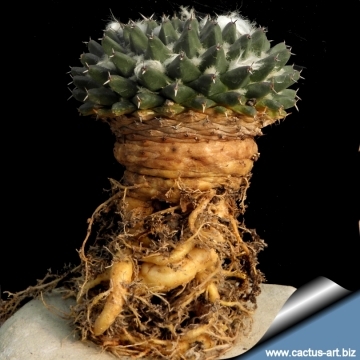 Mammillaria caput-medusae crassior Salm-Dyck in Labour. 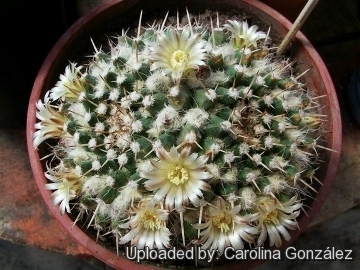 Mammillaria sempervivi var. caput-medusae (Otto) Backeb. 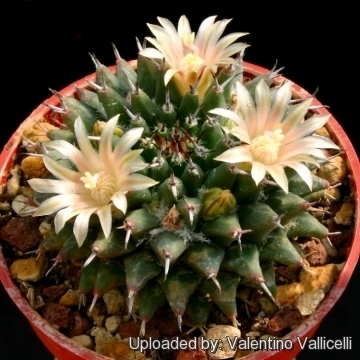 Mammillaria sempervivi var. tetracantha DC. Description: Solitary at first, or slowly clumping flat with ground. 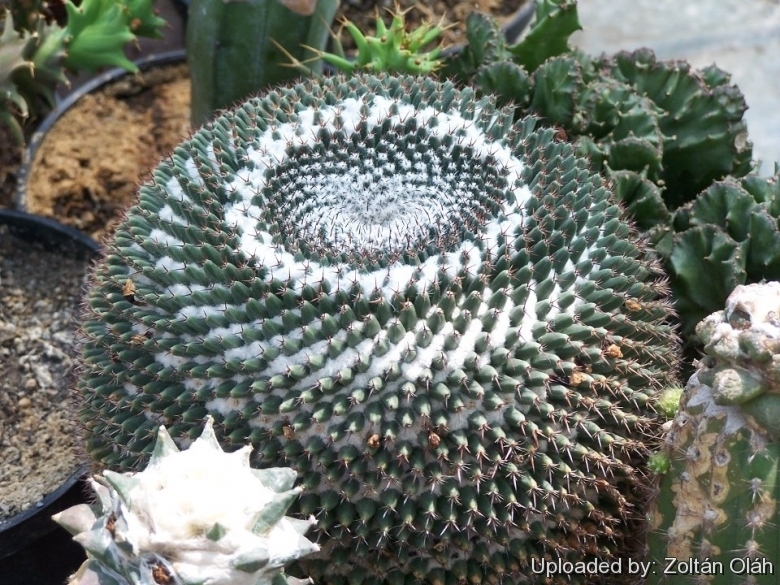 Radial spines: Mostly hidden under white wool, usually on young stems only, 2 - 6, white, bristle-like, to 3 mm long. 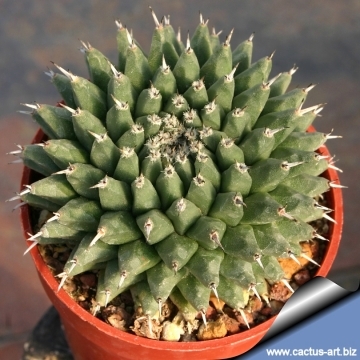 Central spines: 2-3, very short, stout, reddish brown to black, becoming grey with age, to 4 mm long (occasionally the lowermost longer). Flowers: Funnelform in a rings on the crown barely rising above the tubercles, whitish to pale yellow with pinkish midstripe, 1-2 cm long and diameter. Fruits: Club-shaped, red, to 10 mm long. Remarks: The var. caput-medusae and var. tetracantha; often mentioned in literature and sometimes offered in seed lists, should be fully synonymized with the type variety. Notes: The white wool between the areoles makes this species a pleasure to look at and grow, but the diversity among individual specimens is considerable and the best plants have abundant white axillary wool. Hence, it is worth raising a batch of seedlings and selecting one or two that have the most wool. 6) Guadalupe Martínez, J., Sánchez , E., Bárcenas Luna, R. & Gómez-Hinostrosa, C. 2013. Mammillaria sempervivi. In: IUCN 2013. "IUCN Red List of Threatened Species." Version 2013.2. <www.iucnredlist.org>. Downloaded on 17 January 2014. 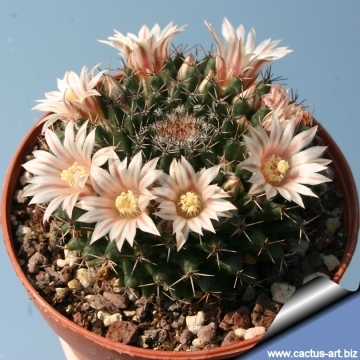 Cultivation and Propagation: This is a popular slow growing and easy to cultivate cactus species. Water regularly in summer, but do not overwater (Rot prone) Use pot with good drainage and a very porous potting media, keep dry in winter. Feed with a high potassium fertilizer in summer. It is quite frost resistant if kept dry, hardy as low as -5° C Outside full sun or afternoon shade, inside needs bright light, and some direct sun. Easily flowered. 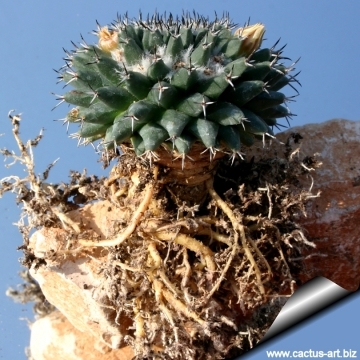 Some plants will slowly offset , and clumps can be produced in time. Propagation: Direct sow after last frost.